Our community is suffering this week. Our people are hanging their heads low, looking over their shoulders and getting where they need to go as quickly as they can. They are also embracing each other and standing together to let the world know that this will not silence us. This is a wake up call. This is to let us know that there is still so much work to be done. This still tells us that we have to continue to stand tall and stand proud and stand together. This tells us that even in the face of danger and in the face of hatred, if we stand together, with our allies, we can begin to defeat some of the hatred in this world. Not all of it, but a lot it. We need to keep showing our faces and our families, and hold hands. We, that are loud and proud, need to continue to advocate for those of us that have no voices or are scared for one reason or another to be seen and heard. We need to continue to fight. In the aftermath of the Orlando massacre (because really, what ELSE can it be called?!?! 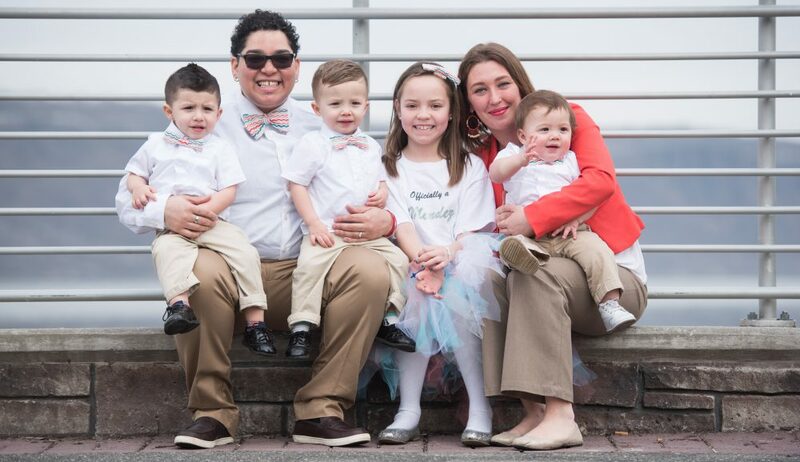 ), it’s so hard to look at my kids, and my wife, and know that doing NOTHING could affect them so terribly, that I refuse to be scared into a closet again. I look at my family and know that I will not be silenced and that I will always do my the most I can and the very best I can to make sure that they are safe and taken care of. I still don’t know how to wrap my head around everything that happened. I still don’t even know if I have fully processed what has occurred. I still cry when I see pictures of the victims because so many of them look like my younger brother or his ex-boyfriend (who is still a huge part of our lives and our family). I look and see the face of my best friend, and sometimes even a future Levi, Noah, and Austin finding a place to call their own with people just like them. It makes me sad for the parents who lost their babies, and for the LGBTQ and Latino communities, Orlando, and the world as a whole. What a sad, sad world we live in. How could a community so kind someone despise? My brothers, my sisters, what can I DO? 2 years of thanking you for tuning in….